Add some green to your mealtime! Skinner SuperGreens™ is a delicious enriched pasta with 5 green vegetables*: Spinach, Zucchini, Broccoli, Parsley and Kale. 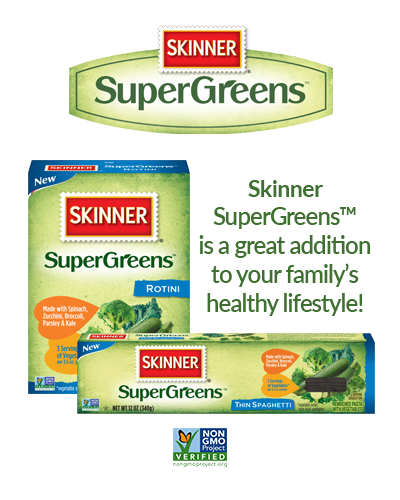 With 3 servings of vegetables in every 3.5oz (100g) portion, Skinner SuperGreens™ is a great addition to your family's healthy lifestyle. It’s also a good source of fiber and 5 vitamins and minerals. Try Skinner SuperGreens™ Rotini in your favorite entrees, side dishes, oven bakes and salads. Skinner SuperGreens™ Thin Spaghetti pairs well with olive oil tosses and other lighter sauces. Both items are available in 12 oz.